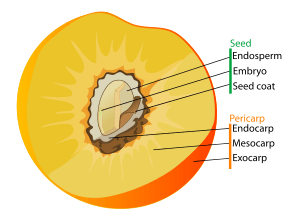 In botany, a drupe (or stone fruit) is an indehiscent fruit in which an outer fleshy part (exocarp, or skin; and mesocarp, or flesh) surrounds a shell (the pit, stone, or pyrene) of hardened endocarp with a seed (kernel) inside. 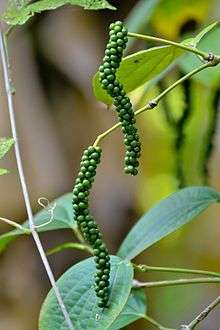 These fruits usually develop from a single carpel, and mostly from flowers with superior ovaries (polypyrenous drupes are exceptions). 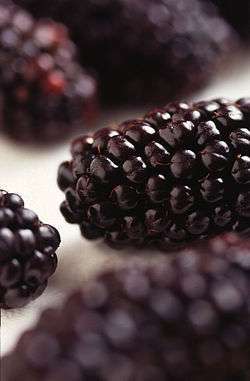 The definitive characteristic of a drupe is that the hard, "lignified" stone (or pit) is derived from the ovary wall of the flower—in an aggregate fruit composed of small, individual drupes (such as a raspberry), each individual is termed a drupelet and may together form a botanic berry. 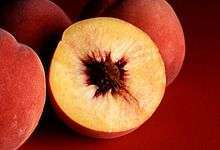 The term drupaceous is applied to a fruit which has the structure and texture of a drupe, but which does not precisely fit the definition of a drupe. The term stone fruit (also stonefruit) can be a synonym for drupe or, more typically, it can mean just the fruit of the genus Prunus. The coconut is also a drupe, but the mesocarp is fibrous or dry (termed a husk), so this type of fruit is classified as a simple dry, fibrous drupe. 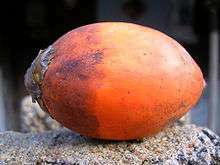 Unlike other drupes, the coconut seed is unlikely to be dispersed by being swallowed by fauna, due to its large size. It can, however, float extremely long distances across oceans. Lastly, other examples may include mangoes, peaches, amla and avocados. 1 2 3 Stern, Kingsley R. (1997). Introductory Plant Biology (Seventh ed.). Dubuque: Wm. C. Brown. ISBN 0-07-114448-X. ↑ Kiger, Robert W. & Porter, Duncan M. (2001). "Find term 'drupaceous'". Categorical Glossary for the Flora of North America Project. Retrieved 2015-08-14. Look up freestone in Wiktionary, the free dictionary. Look up clingstone in Wiktionary, the free dictionary. "Drupe". New International Encyclopedia. 1905.